We will take a trip to the natural wonder of this valley that is the lowest, driest and hottest area in the Western Hemisphere. 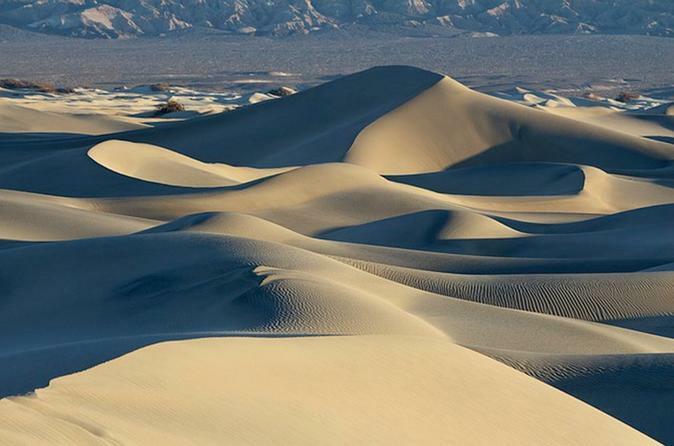 On average,192 days per year in Death Valley have temperatures that reach 90 °F or more. Enjoy the beautiful geological features of this incredible National Park that is filled with stark beauty and extremes. There are high mountain peaks and huge sand dunes. Badwater Basin is the lowest spot in North America and lies in a giant salt flat. There are narrow winding canyons, colorful badlands, old ghost towns and an ancient volcanic crater. This is a beautiful and unique experience! We will pick you up at 8:00 am and drive you over the Spring Mountains to Death Valley National Park. We'll pass by the famous Amargosa Opera House far out in the Mojave Desert and drop down into the infamous Death Valley. We will drive up to Dante's View, 5000 ft. above the valley floor and see the vastness of the Panamint Mountain range. We'll stop at Zabriskie Point for pictures of this scenic badlands. Next we head for Badwater Basin, the lowest point in the northern hemisphere at 282 ft below sea level. After a drive through the Artist's Pallet we'll stop for lunch at Furnace Creek, once called Greenland for the surprising vegetation growing around the springs. We'll visit the Borax museum, home of old machinery used in the process of mining Borax and then stop off at the Park visitor center for a short film and some great information about the history and geology of the area. After a great day in Death Valley we'll head back to Vegas. Additional sites may be visited upon request.